Most of the best detections of features in the atmospheres of transiting exoplanets have come from the Hubble Space Telescope, but time on hugely expensive satellites is in high demand and limited. Thus a recent paper led by Nikolay Nikolov from Exeter University is a welcome development. 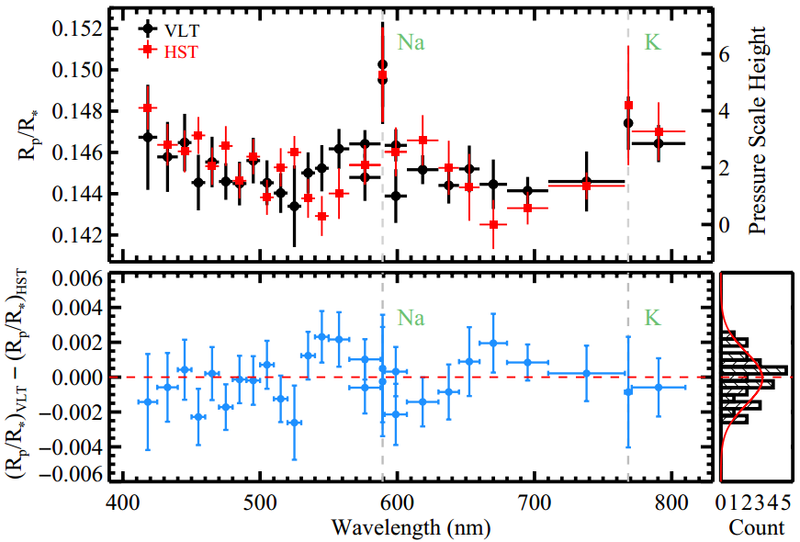 Nikolov and his team observed WASP-39b and detected a strong Sodium line from the planet, which indicates a clear atmosphere. The result came from the newly upgraded FORS2 spectrograph on ESO’s Very Large Telescope. The important feature of the plot is that the VLT data (black) are every bit as good as those from a previous detection of the same line using the Hubble. While Hubble has the advantage of being in space, the VLT has a much larger mirror and can observe whole transits without the gaps seen in Hubble data owing to its low-Earth orbit. The similar result from a very different facility also gives confidence in the correctness of such detections of features in exoplanet atmospheres, which are, after all, pushing current technology to its limits. This entry was posted in exoplanet atmospheres, WASP planets and tagged FORS2, Sodium, VLT, WASP-39b on November 14, 2016 by waspplanets.